We had a full day to explore Bendigo, and it really wasn’t long enough. We started at Bendigo Pottery and even though some of their pottery is very reminiscent of the 1970s, they still have some very nice articles. They have just commenced a new line of hand thrown vases with a majolica glaze, very similar to John Campbell’s work. Following this, we headed to the centre of the city and the Information Centre, where they had a very informative DVD displayed inside an old hawker’s coach, describing how the gold was extracted and with 3D diagrams of the diggings. We were amazed that the city hasn’t caved in! A visit to the Shamrock Hotel was next (Charles and Diana were here in 1983), a beautiful building which still retains its tiled floor, columns, arches and stained glass. 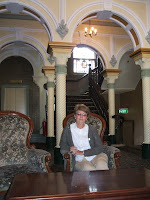 We were able to walk upstairs and out onto the verandah – it must have been very grand when first built, it still is. One of us climbed to the top of the poppet head on Camp Hill (not has high as the first level of the Eiffel Tower) for a stunning view over the district, before walking through the gardens to the Chinese Museum. What a treasure this turned out to be – very interesting, lots of artefacts and some absolutely stunning parade dragons and banners. We spent quite a bit of time in here before heading for the Chinese garden, which made a lovely change from all the Japanese gardens we have seen. After this it was off to the Town Hall for a guided tour – these are held on Wednesday afternoon and Sunday mornings, so we struck it just right. This lovely old building is really only used for council meetings and is still in the process of being restored. The large reception room has been completed and looks magnificent, with its gilding and frescoes. It has been cloudy, warm and windy today, so after all the walking we had done – in shoes!!! – we had a rejuvenating half hour in the spa at the caravan park. It does look like a very grand place, doesn't it? Jack's now counting down the sleeps... (he was asking for Grandpa yesterday).